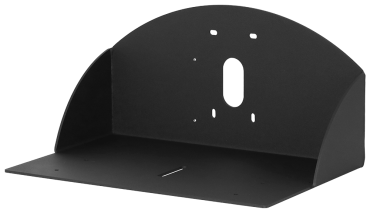 For Polycom RealPresence Group series 300, 310, 500 or 700 codecs with the Polycom EagleEye IV camera. Get more from your codec: Bridge traditional videoconferencing equipment into the USB-based conferencing applications such as Skype for Business, Google Hangouts, or Zoom that your budget-minded customers may prefer. Make your camera a conferencing camera, without a codec: OneLINK Bridge connects a non-USB camera and audio source, and bridges to a USB stream for easy connection to USB-based conferencing applications such as Skype for Business, Google Hangouts, and Zoom. You get traditional videoconferencing audio quality with soft-client connectivity – and without the traditional videoconferencing price tag. Sounds complicated – but it's not. 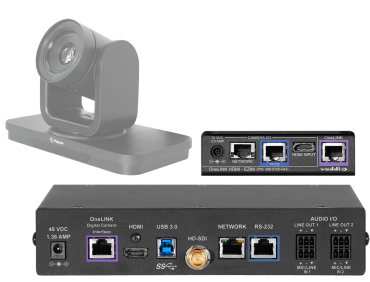 Tailored for Polycom codec systems and compatible with the Polycom EagleEye IV camera, this OneLINK Bridge kit simplifies installation by extending power, video and control to your camera over a single Cat-5e cable up to 328 ft (100m). IN-Wall Enclosure for Polycom EagleEye Attractive IN-Wall Enclosure designed to fit the Polycom EagleEye and the EZCamera Interface Module (EZIM) in the back of the box to enable Cat. 5 cabling.